Map of Paris drawn for the 1889 Exposition Universelle. Nouveau Plan Complet Illustre de la Ville de Paris en 1889. 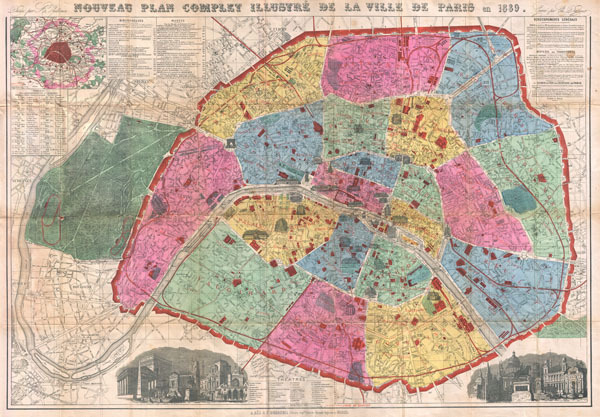 A bright and stunning map of Paris made by A. Vuillemin for the 1889 Exposition Universelle (World's Fair). Covers the walled center of Paris as well as its immediate vicinity to the west, including the Bois de Boulogne. Important buildings are noted throughout and often shown in profile. The park where the 1880 Exposition Universelle was held, called the Champ de Mars, is noted. At the western end of the Champ de Mars, the Eiffel Tower is also noted as 'Tour Eiffel 300 Meters.' It is actually 324 meters. The Eiffel Tower was built to be the entry arch to the 1889 Exposition. That the Eiffel Tower is not drawn in profile, as are so many of Paris' great monuments, is a curious reminder that, at the time, the iconic structure was considered an eyesore. The lower right and left quadrants feature architectural views that include many of Paris' most notable buildings out of context. Indexes scattered around the map indentify theaters, libraries, museums, railroad lines and 'curiosities.' All text in French. Color coded by arrondissement. Drawn by A. Vuillemin and engraved by Charles Dyonnet for publication by A. Bes and F. Dubreuil. Very good. Original folds exhibit some wear and verso repairs, especially at fold intersections. Folds into original red cardboard booklet.